In this week’s economic update, we breakdown the key themes emanating from the recent FOMC statement before investigating positive data pertaining to volatility and labour market performance within the US, UK and Europe. Eagerly awaiting the decision from the Federal Reserve (Fed) on interest rates, market participants on Wednesday were once again looking for a strong steer on monetary policy. The outcome, leaving interest rates unchanged at 2.25-2.50%, came as no surprise. The decision means rates have now been on hold since December 2018. Prior to this the Fed had been indicating a strong desire to keep pushing rates higher, having already raised rates 9 times in 3 years. The key message from the Fed was confirmation of a rethink on future interest rate policies. This was accompanied by a statement of intent on balance sheet reduction, which we explain later. First though, the message on interest rates. The ‘dot plot’ in the chart below, which shows the trajectory of the intention of Fed officials voting, has become more dovish. The larger dots show where views cluster, but the dots do not indicate the names of the officials voting. Interpreting the dot plots we can see that previously two rises were expected in 2019, but the Fed now indicate they will stick at current levels for the year ahead. Further out, expected rate rises have also fallen back, with only one rate rise expected in 2020. Interest rate rises form just one part of the Fed’s communication. It also revealed plans to bring the current balance sheet reduction to an end. In the wake of the 2008 global financial crisis the Federal Reserve injected liquidity into the financial markets by buying up bonds in the market using newly created cash; a process called quantitative easing (QE). As the economy recovered, the policy was no longer necessary and as the economy improved further the programme was put into reverse with the Fed effectively withdrawing the liquidity it had once injected, at the rate of $30bn per month. In a signal to the markets that it is once again gently easing monetary policy the Fed has announced that, from May, it will reduce these capital withdrawals down to $15bn per month with a view to ceasing withdrawals altogether in September. So how are investors judging the Fed’s decisions? In one camp we have economists and commentators, joined by President Trump, who believe the decision to hold interest rates steady is pro-business and pro a strong stock market. However, there are others who are taking the announcement to mean the Fed are concerned about flagging growth. They expect future economic data out of the US, particularly so in the face of trade tensions, to be worse than the consensus. 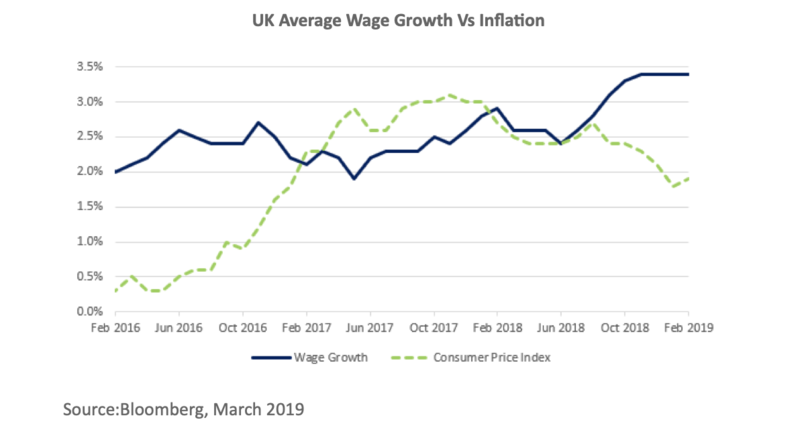 In yet another camp there are many who worry about accelerating wage growth (currently around 4.2%), fearing this will feed into inflation and put the Fed at a disadvantage later if they are forced to reverse course. With a wide divergence of views kicking around the Fed Chairman, Jerome Powell, has been facing criticism (we do not know of a Fed Chairperson who hasn’t) for failing to articulate his stance to markets as coherently as some of his predecessors. However, he has in our view made things relatively simple and is taking a sensible line. He has stated that the Fed is operating in a data dependant way. In his words, “current data being observed is not sending a signal that we need to move in one direction or another”. Market participants looking for more sophisticated analysis may be perplexed by his statement. From our perspective it reflects reality; you cannot always point to the right direction until the fog clears. This isn’t hesitancy by Powell and his officials to act, it is them pausing to reflect before taking whatever action is necessary and proportionate for a later stage. In other news: The Bank of England’s Monetary Policy Committee also voted to keep interest rates on hold at 0.75% this week, against a backdrop of Brexit uncertainty. 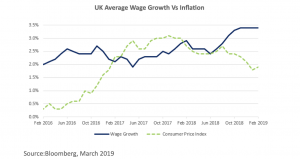 Wages, Jobs & Wages Again – Remain Positive! As the April 12th Brexit deadline looms, the clouds of uncertainty as to the eventual outcome have not dissipated. Whilst this causes confusion and concern, economic data released this week should evoke positive feelings, both around the globe and domestically. Despite weaker European industrial output, recent figures from the Eurozone show average wage growth increasing from the previous quarter. Annual, nominal, hourly pay increased at the rate of 2.3%, the highest rate of growth since 2009. Digging beneath the data there have been some areas where wage has slowed, in Germany and Italy, but pay increases are evident across the remaining 17 members, with Portugal, Spain and the Netherlands all reporting improvements. Most surprisingly, France showed a significant increase in wage growth from 1.6% to 1.9%. Senior economists pointed to the fact that despite on-going ‘yellow-vest’ protests, this up-tick in wage growth reinforces France’s position as a major economic performer within Europe. Pay increases are being experienced across all industries, but with greater emphasis coming from within the service sector which remains very robust in Europe. 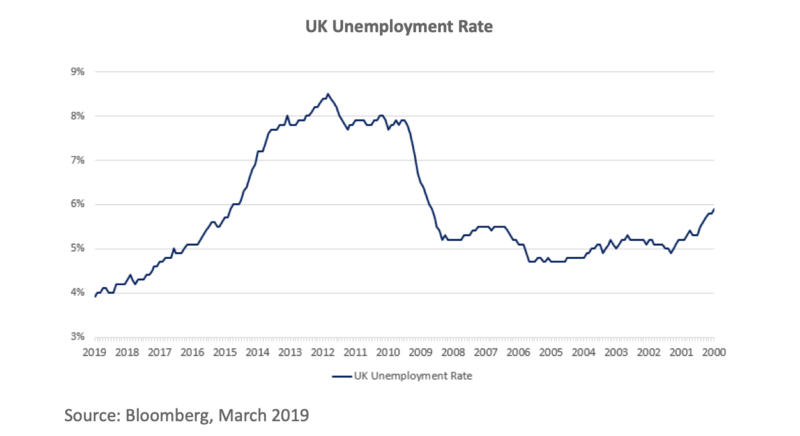 While we appreciate the difficulties of evading Brexit headlines, earlier this week the Office for National Statistics (ONS) reported that unemployment within the UK had fallen by a further 35,000. This now leaves the total population without employment at 1.34 million, or 3.9% of the labour force, the lowest figure since 1975 and well below the EU average of 6.5%. 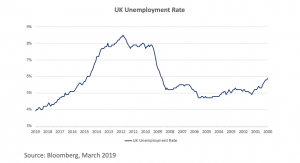 The UK’s employment Minister, Alok Sharma, commented that recent employment growth represents further evidence of a resilient economy despite Brexit adversity. We can see this from the chart below. The fact this isn’t a cause for celebration is a complete mystery to us. The effects from positive real wage growth include a capacity for increased spending or, alternatively, the option to increase savings. Both can spur economic growth. The former through increased consumption of goods or services and the other through savings channelled efficiently into investment activity. Brexit is fraying the nerves of UK citizens and yes, ultimately, whatever outcome eventually comes to fruition there will be consequences that may not have been considered. In fact, we cannot imagine a scenario in which the media will choose not to peddle bad news and inflame feelings. Meanwhile, regardless of what is taking place around Brexit, businesses are increasing profits, creating more jobs and paying better wages. The more we consume bad news, the more we become blinded to positive developments happening right in front of our noses!